Home / Shop / Brands / Precor / Precor AMT 100I Commercial Elliptical. Call Now For Lowest Pricing Guaranteed! 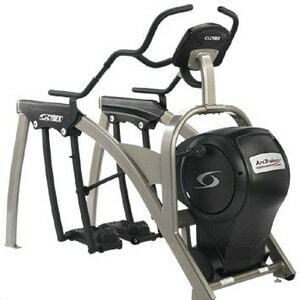 SKU: PRE AMT 100I Categories: ellipticals for sale, Precor, Precor AMT - Adaptive Motion Trainer, Precor Ellipticals, Ellipticals Tags: Commercial Refurbished Elliptical, Precor AMT 100I Commercial Elliptical. The Precor AMT 100I is a versatile and functional elliptical trainer that features adjustable stride length of up to 27 inches. It is very intelligent, with a Stride Dial function that provides on-the-spot feedback on how the targeted muscles respond to the various movement patterns of the elliptical trainer. It is also integrated with a bio-feedback center that gives encouraging workout statistics like calories burned, elapsed time, average speed, and distance covered. It has five pre-set programs and 20 resistance levels. Display read-outs like average speed, heart rate, calories burned, distance, reesistance, stride length, stride per minute, among others. The AMT 100I can be compared to the Precor EFX 556 V3 in several ways. Like the AMT100I, the EFX 556 V3 shows exercise statistics like average speed, elapsed time, heart rate, and calories burned, among other useful information. 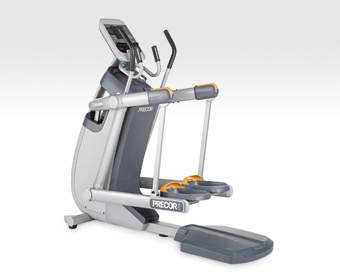 Both Precor models also feature 20 levels of resistance. 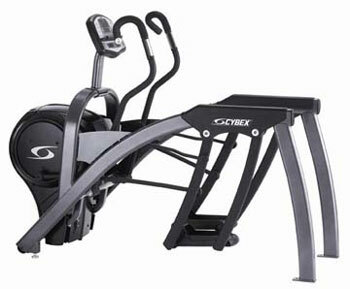 Likewise, these two elliptical trainers can hold exercisers weighing as much as 350 pounds. 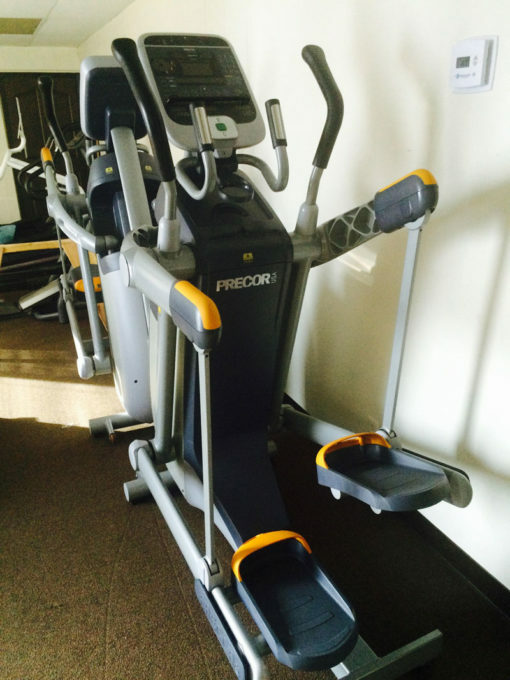 But there are also a lot of differences between these two Precor products. The AMT100I is not as user-friendly as the EFX 556 which has accessories like water bottle holder, utility tray, and reading rack. The EFX 556 also has more programs (9) compared to the 5 of the AMT100I. And the EFX 556 console supports numerous languages apart from English like Dutch, Spanish, German, Portuguese, French, Romanized Russian, and Italian. But the AMT100I has a more impressive Stride Dial function that the EFX 556 does not have. The Precor AMT 100I is certainly an advanced elliptical trainer that makes it a practical investment to any commercial or home gym owner. 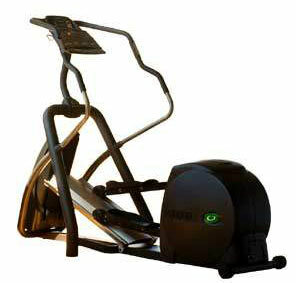 3 reviews for Precor AMT 100I Commercial Elliptical. Call Now For Lowest Pricing Guaranteed! Purchased this through Gympros. Awesome experience . Speedy delivery and unit arrived in excellent condition with certified warranty . Excited to lose the weight and get into shape for the summer . After having knee surgery 4 years ago, even the thought of running gave my knees anguish. After joining 24 hour fitness and watching wallpaper dry on the recumbent bike for months on end I finally made my way to the Precor AMT 100i. It’s a great adaptive trainer and does allow us to have an awesome stride which I was able to find and use both upper and lower body together. It really engages my core and my workout is 1000% more challenging with better intensity intervals. Gym Pros was awesome to work with . I shopped around and they offered the best service and turnaround so the choice was easy. After starting to workout on the Precor AMT 100i, I definitely noticed a big difference in caloric output with zero impact. When we opened up our fitness studio last year, we ordered 3 all from Gym Pros. These guys definitely got it right, take note that this is a big unit but the adaptive motion trainer is not as long as their standard ellpiticals.